Federico Santander scored as Bologna beat Inter Milan 1-0 for their first win in over four months to give new coach Sinisa Mihajlovic the perfect start and pile the pressure on Inter boss Luciano Spalletti. Spalletti and his team were booed off the pitch at the San Siro after their third-place cushion was cut to just five points on city rivals AC Milan who travel to Roma, in fifth, later Sunday. Relegation-threatened Bologna sacked coach Filippo Inzaghi and replaced him with former boss Mihajlovic last Monday. "In any case, I repeat, I don't feel under scrutiny. The team is still behind me, I'm convinced. "I'm used to whistles in this stadium and throughout my career and they do not effect me," added the former Roma and Zenit St Petersburg coach. "We continue to work, the fans realise that we are below expectations, they pay the ticket and deserve something different from what was shown today. "Especially if the team is called Inter." 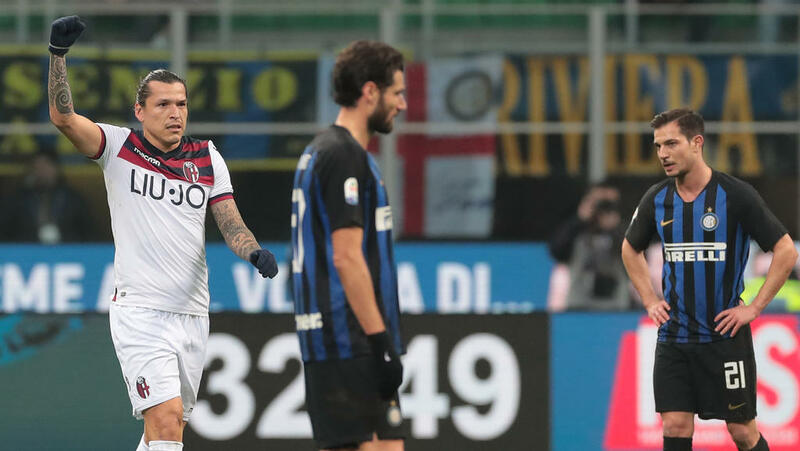 The damage could have been worse but for a solid performance from goalkeeper Samir Handanovic, while captain Mauro Icardi missed a chance within the first minute when unmarked in front of goal. Lautaro Martinez came off the bench after the break but headed just wide with the normally prolific Icardi again wasteful to extend his goal drought in Serie A to six games. Andrea Ranocchia was denied a late equaliser by Bologna keeper Lukasz Skorupski as the northern side reignited their push for top-flight survival. Earlier Fiorentina -- who thrashed Roma 7-1 in the Coppa Italia midweek -- battled back to share a point with Udinese. Danish defender Jens Stryger Larsen opened the scoring for Udinese in the 56th minute with Edimilson Fernandes levelling nine minutes later for a 1-1 draw. Fiorentina are ninth, just four points off the Champions League places with Udinese two points above the relegation zone. Paraguayan striker Toni Sanabria scored his second goal in as many games for Genoa since his loan move from Real Betis, in a 1-1 draw with Sassuolo. Filip Djuricic had broken the deadlock just before the half-hour mark but Sanabria equalised four minutes before the break. Sassuolo are 11th with Genoa in 14th position after 22 games.